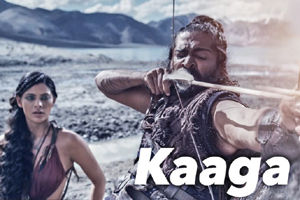 A Classical song sung by Kaushiki Chakraborty starring Harshvardhan Kapoor, Saiyami Kher. The audio of this song is available on YouTube at the official channel T-Series. This audio is of 2 minutes 50 seconds duration. Lyrics of "Kaaga Re Kaaga Piya Ki Khabar Sunaana"
Lyrics in Hindi (Unicode) of "कागा रे कागा पिया की खबर सुनाना"